A small group of children, all cousins, stood on a driveway in the forest-covered hills of central PA, giddy, waiting. Every year, for the last 13 years, our extended family has gone away together for a week, and at some point during those 13 years, Uncle Ben began a tradition of creating a treasure hunt for them. Every year, the search grows more intense, the prizes more spectacular. It was a year of rain, and we were all happy to be outside, stretching our legs or, as Maile’s grandmother used to say, blowing the stink off. Leo wasn’t expecting the welcome. 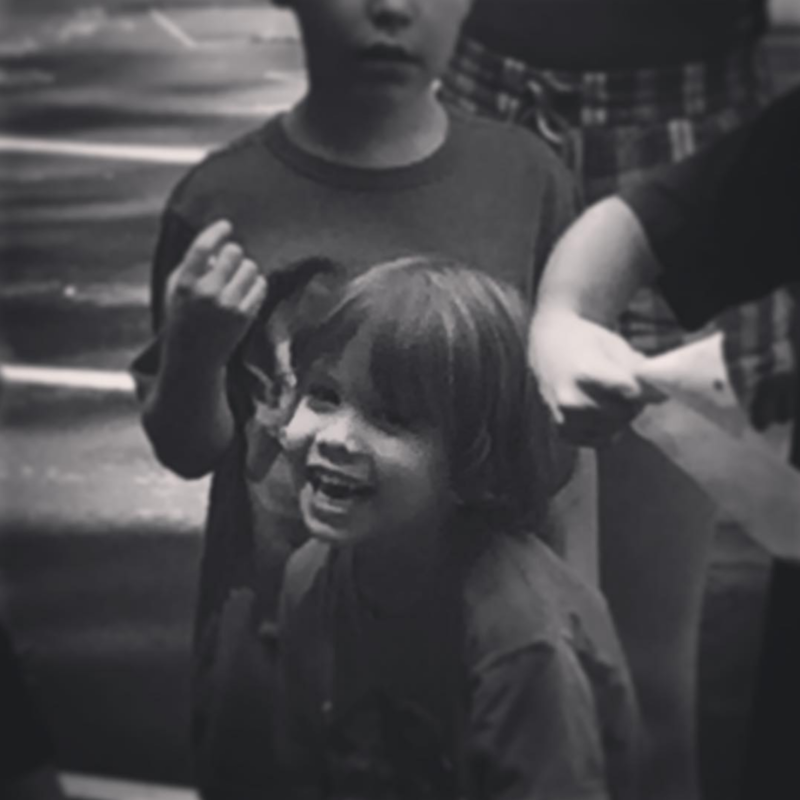 He was overjoyed to be with the big kids, and his face overflowed in a grin. There is so much power to being included, to being welcomed in. I have a few very early memories. Jumping from the back door of the trailer where we lived in Missouri when I was 2 or 3, into the waiting arms of my grandfather. My sister burning her hand on the kerosene heater when I was 3 or 4. Arriving at our trailer park’s swimming pool in Laredo, Texas, when I was 4, only to discover it was abandoned, empty, and filled with snakes. And this one: waking up on a normal afternoon, only to discover I had slept through Mr. Rogers. Seriously! I was so little, yet I remember that day! I was devastated. But why that memory, seemingly unimportant, so random? Maybe that’s less the sign of an unimportant memory as it is the importance certain messages hold for children, for all of us really, about being loved and accepted. There are many ways to say I care about you. When I saw Leo erupt with joy, smile a mile wide, I was reminded, for the first time in a long time, how wonderful it is to feel accepted, how important it is that we include each other whenever we can. I wonder why I don’t include more people in my life, in more ways? Usually it’s because I’m afraid I will receive less, or maybe I’ll become less important, or maybe they’ll change the way I currently do things. Usually it’s based out of fear. Who do we tend to exclude? Often, children. Often people who don’t look or sound like us. Refugees. A strange neighbor. Including and loving people, bringing people along on our journey and offering grace, will change the world. Who can you include in your life? Who, currently on the outside, can you invite in? This is Leo at the very moment Uncle Ben announced he would be included in this year’s treasure hunt.